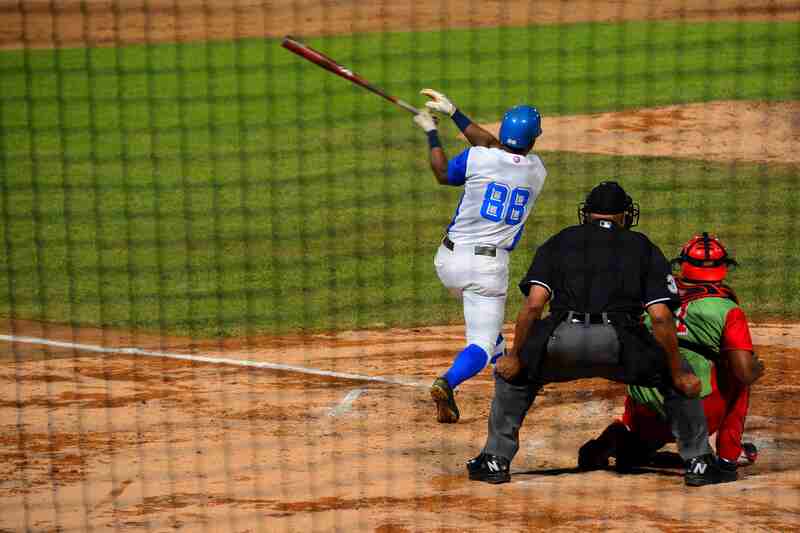 Baseball in Cuba – It’s a Home Run! There are many religions practiced in Cuba, but the universal religion is baseball. Cuba and baseball have an inseparable history. The game was first introduced to the island by students returning home from the U.S. in the 1860s, and it became an instant hit (no pun intended). My wife Nancy and I recently visited this fascinating country, where we had the opportunity to immerse ourselves in the country’s baseball culture. Being our third trip to Cuba, we were already aware of the country’s obsession with its national sport and heroic admiration for its players. To prepare for the trip, I purchased several baseballs, including a blue and red Boston Red Sox collector’s edition. After an extensive search, I found a sports card dealer who specialized in cards featuring Cuban-born players now with major leagues in the U.S. I purchased 100 cards. Beginning in the 1960s, Cuban baseball players began defecting to the U.S. in search of greater opportunities. More than 200 Cubans have played in major leagues including many superstars such as Jose Canseco, Luis Tiant, Rafael Palmeiro, Bert Campaneris and Tony Perez, to name just a few. In fact, the U.S. has the most Cuban players in the National Baseball Hall of Fame, then Cuba. This speaks volumes about the baseball talent this island nation of 11.5 million inhabitants has brought to our shores. One of the undeniable successes of Fidel Castro’s tenure is sports. Along these lines, baseball is king. A young Cuban can enter the country’s baseball program (or any sports program) at age 8, and, at no financial cost, have full access to skilled trainers, coaches and sports psychologists. These people are held in extremely high esteem by the government and citizens. This opportunity to participate exists in even the smaller towns. Each participant will spend several hours a day in the program developing his skills while also maintaining the same classroom curriculum of non-sports participants including math, science, languages and the like. The participant must maintain a favorable average to stay in the program. Although a fraction of 1% of those who show talent will go on to be professional athletes, 100% of them will get a complete and comprehensive education to fall back on. Along with developing athletic skills, participants learn respectful competition, conflict resolution, self-discipline, sportsmanship and teamwork, and make many lifelong friends along the way. I spoke to program participants between the ages of 8 and 18, and all told me that they understood the value of this opportunity and indicated that they were willing to spend as many hours as necessary on their academic studies to participate in the baseball program. A YOUNG PARTICIPANT IN CUBA’S BASEBALL PROGRAM SLAMS BALL AFTER BALL INTO A WELL WORN NET WITH SURGICAL PRECISION. In the town of Santa Clara, I saw a young man and his brothers playing baseball in the town square with a worn-out bat and a dilapidated ball. To Cuban children, the gift of a new baseball is a big deal. After speaking to his dad and getting the OK, I gifted the boys a baseball. They and their father were ecstatic. We were thanked with hugs and smiles that we will never forget. 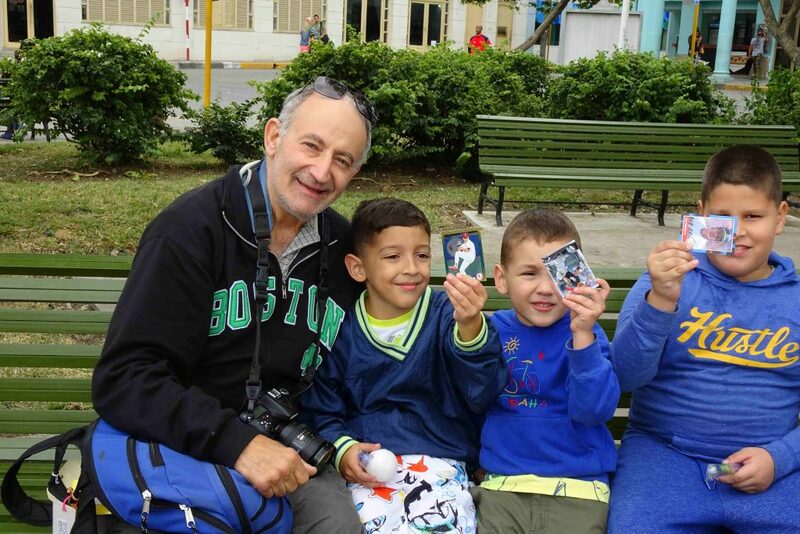 THE AUTHOR GIFTS A BASEBALL AND BASEBALL CARDS OF CUBAN PLAYERS IN THE U.S. TO THREE YOUNG BROTHERS. 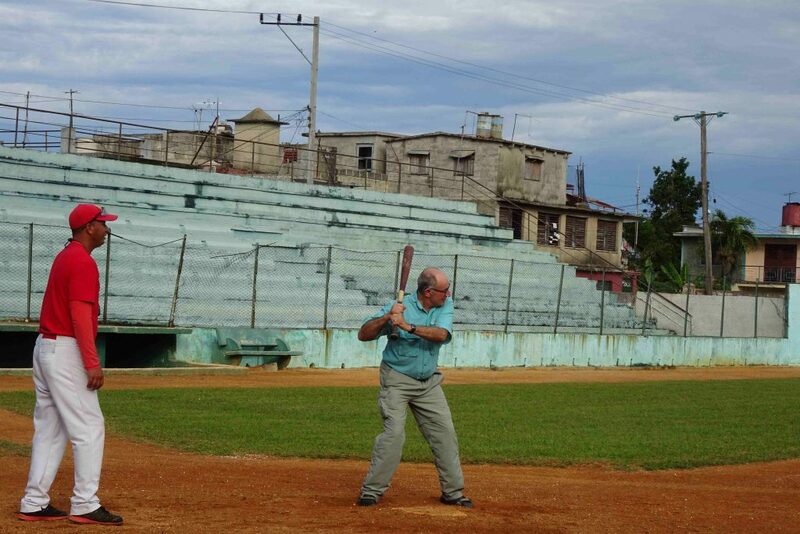 In the Pueblo Nuevo neighborhood of Matanzas 70 miles east of Havana, we visited Palmar del Junco, the oldest continually operating baseball stadium in the world, and the birthplace of organized baseball in Cuba. It is here in 1874 that the first official baseball game in Cuba took place. This stadium has been in continuous operation for 144 years! Our tour began with a discussion with Cuban Hall of Famer and two-time Olympic gold medalist Jose Estrada. He was one of Cuba’s best offensive and defensive players throughout the 1990s and was voted one of the country’s 100 greatest athletes. He is a handsome man with an infectious smile. At 50, he is muscular and fit, and still looks like he could hit a baseball to the moon. I handed him the Boston Red Sox collector’s edition ball and six baseball cards featuring Cuban stars of his era in Major League Baseball. He recognized all the men and thanked me. He was overjoyed to receive the Red Sox ball, and my guess is that it now resides in a display case in the small but tasteful Cuban Baseball Hall of Fame museum on the property. 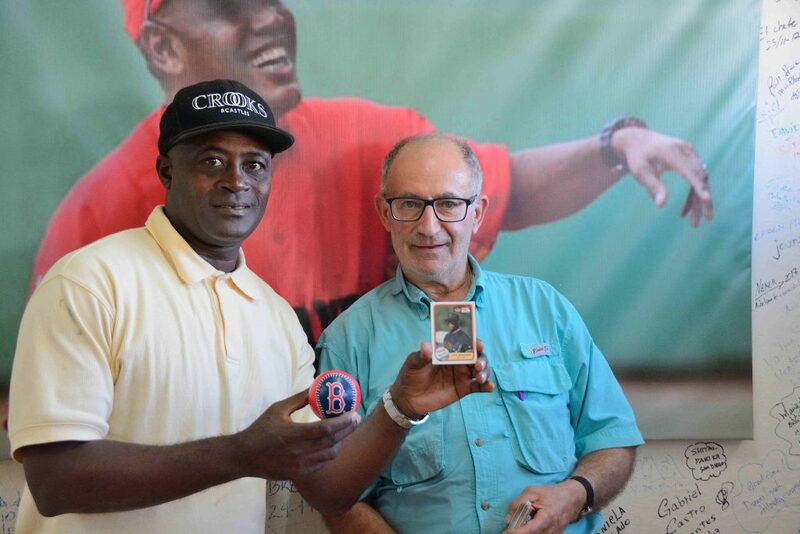 THE AUTHOR WITH CUBAN HALL OF FAME PLAYER JOSE ESTRADA AND THE BOSTON RED SOX BALL THE AUTHOR GIFTED HIM AND A BASEBALL CARD OF ONE OF HIS FAVORITE US PLAYERS LIVIAN HERNANDEZ. We toured the field and received a firsthand understanding of the country’s wildly successful baseball program. I watched mesmerized as a 12th grader slammed ball after ball with surgical precision into a well-worn net backstop, stopping only briefly to allow the batting tee to be reloaded. His coach moved the tee up and down an inch at a time until the hitter had the opportunity to sharpen his swing throughout the entire strike-zone range. Pitching, fielding, throwing, catching and running coaches worked one-on-one with their young athletes on the field. Members of our group tried our hand at batting. Slow pitches came my way and I managed to barely hit (I emphasize barely) two of the five balls. Hitting a baseball pitched at less than a third of the speed that a professional pitcher would throw is not as easy as it looks. The whole experience was wonderful. 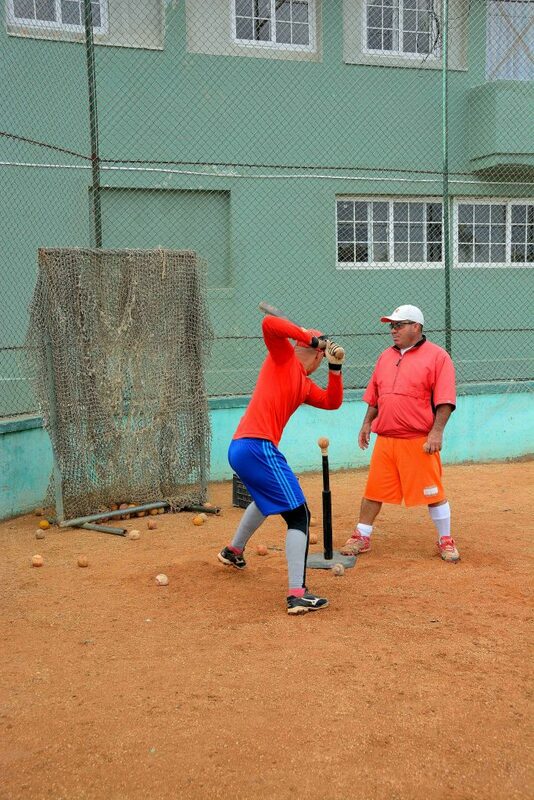 THE AUTHOR TAKES BATTING PRACTICE AT PALMAR DE JUNCO, THE OLDEST CONTINUOUSLY OPERATING BASEBALL STADIUM IN THE WORLD. We then traveled to Havana, the epicenter of the country’s baseball culture. 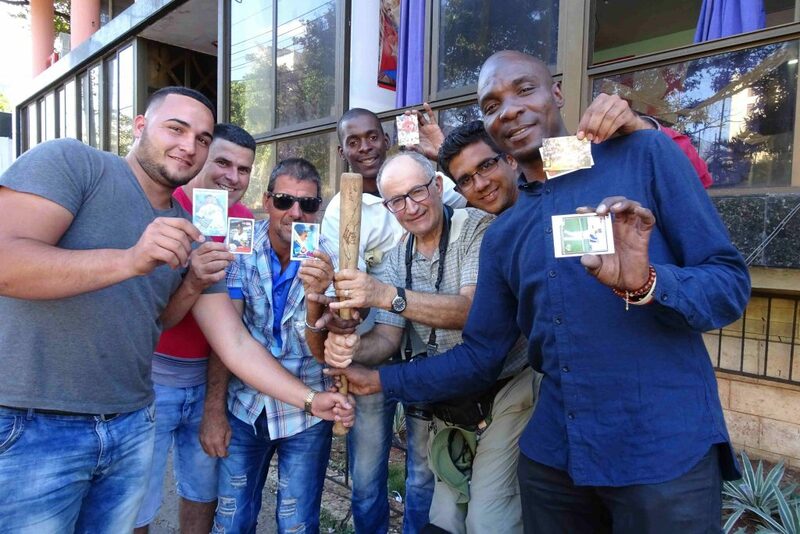 I handed my Cuban baseball cards to taxi drivers, hotel staff, waiters, students, families and people on the street. They were accepted with wild joy and I was thanked profusely. Students asked us to meet their families, cab drivers displayed the cards on their dashboards, and people on the street invited us into their homes for dinner. In the poorer neighborhoods of Havana Viejo, we watched kids playing ball using a stick and bottlecaps, with bases made from scraps of cardboard. Part of the beauty of the game is that no specialized equipment is needed. I handed out two baseballs after the children assured me that the balls would be shared, and the kids went wild. The excitement brought adults out from their homes and many baseball cards were distributed. All were delighted with these and we received thank-you’s and hugs. At one of the many craft fairs on the street, I gave a young man working his booth my stack of baseball cards and told him to take any cards he wished. He recognized a specific player who had grown up in that exact neighborhood. The word soon spread, and in an instant, we had 15 new friends, young and old, male and female. I passed out cards to anyone who wanted them — which was everyone. We all had a wonderful time. While we were in Havana, the semi-finals of the National Series were underway. Our amazing guide Mily said she could possibly get our group tickets if we were interested. Are you kidding? We were all interested. After numerous calls Mily returned with a smile and told us to meet her in the hotel lobby at 6:30 that evening. Mily is a Havana resident and a professional guide of 17 years. She can “make things happen.” We arrived at Estadio Latinoamericano (Latin American Stadium) about 15 minutes before the game and the place was packed. 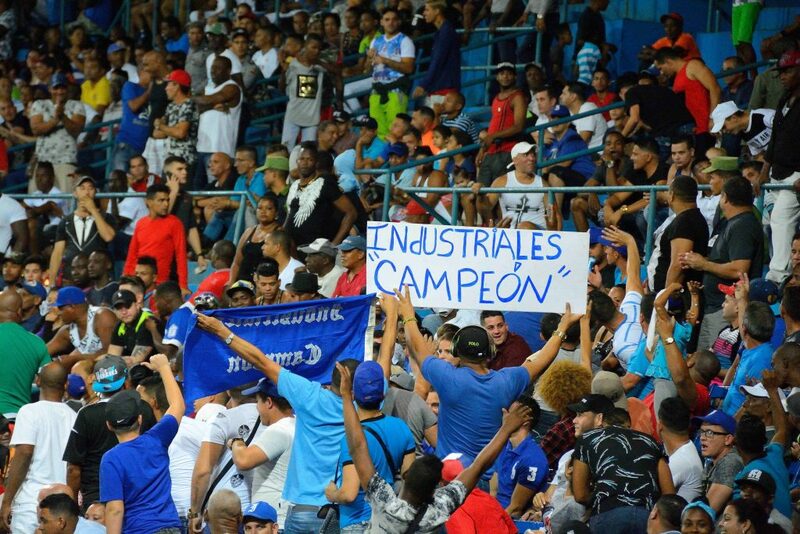 This stadium is the Yankee Stadium of Cuba, and the home team — the Industriales — is like their New York Yankees. There was a standing-room-only crowd of 55,000, as well as a large crowd outside the stadium. Residents of apartments in high-rises overlooking the stadium were renting out their balconies. Castro once said sports should be “the right of the people, not the right of the wealthy” and so baseball tickets are available to everyone at 1 Cuban Peso each. That’s 5 cents, and this is not a typo, friends. Five cents! We entered the stadium and took our seats in the 15th row. These were great seats by all standards, but Mily was not satisfied. She gathered all 11 of us and we worked our way through the crowd to an usher. A gift of 5 CUCs (less than $6) discretely changed hands, and soon we found ourselves in the fourth row directly behind home plate. These seats were exactly two rows back from where Raul Castro and the visiting President Barack Obama had sat when they attended a game here in 2016. THE SEMIFINAL GAME BETWEEN HAVANA AND LAS TUNAS. We watched a very exciting game between Havana and Las Tunas with plenty of action on the field. The crowd was part of the show. Unlike in the U.S. when the crowd cheers after a play, in Cuba the crowd begins cheering wildly before the game even begins, and nonstop until it ends. A hit or a play at a base sends the place into hysteria, and when a run scores, the earth shakes from the cheering. Cuban fans enjoy the game with a passion that is not rivaled even in the major league baseball games in the U.S. THE CHEERING CROWD DURING THE SEMIFINAL GAME BETWEEN HAVANA AND LAS TUNAS. So, there you have it friends. Should you find yourself on this fascinating Island which is totally unique, and unlike the other 81 countries I have had the good fortune to travel to, a Cuban league baseball game should be at the very top of your bucket list. Baseball is supposedly America’s game. Convincing a Cuban of this might be difficult. 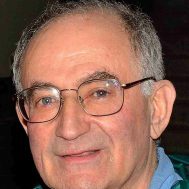 Howard Axelrod is an Ashland, Massachusetts resident, travel photographer, and writer and former high technology executive.